Useful services for project management. No epithets! Given: own and outsourcing projects, some participants work remotely. Required: you need to quickly assign tasks to performers, plan sprints, track performance and statuses, visualize processes and share results with customers. Choosing for ourselves services with the help of which we could work on projects several times more efficiently, we had a whole list of various services of task and time management, for managing and planning projects, team work, building online diagrams, etc. Initially, there were more than 100 services, but the list was gradually reduced, and we opted for three that met our needs best: Jira , Slack and GanttPro . But, if suddenly these services do not help you in planning tasks and working with a team, we’ll share with you the full list! The search process is often complicated by the fact that all services, as one, write “The best service that helps to turn your ideas into reality and realize your projects. Today.". So, what are you doing? Therefore, in this list without unnecessary epithets, just what service is able. 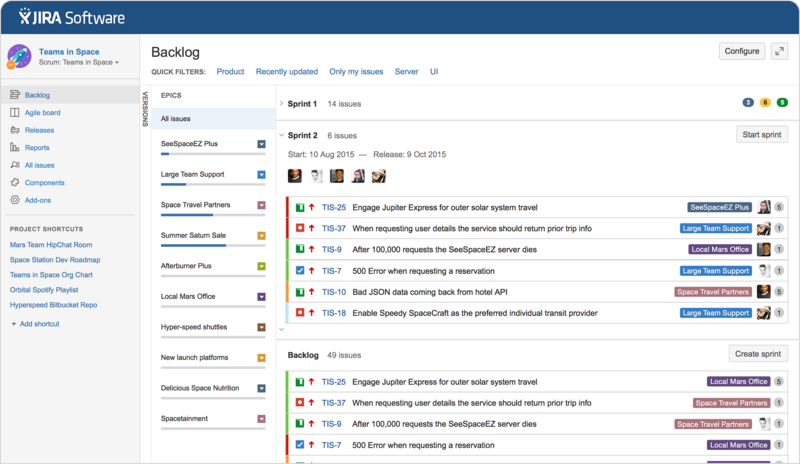 1 Jira is a powerful online service that allows development teams to plan projects, assign task performers, plan sprints and collect tasks as backlog, set priorities and deadlines. • Drag & Drop for drag and drop tasks in backlog, in sprint. • A large number of filtering settings. • Visualization - allows you to quickly navigate and make changes in the sprint. • Ability to select reasons for closing tasks. • Ease of project management. • Simple and convenient time tracker. • Due to the huge amount of settings, it is very difficult and takes a long time to understand them, it is often difficult to just find the answer to an interesting question, the FAQ does not describe the ways to solve problems in sufficient detail. • There is no possibility of assigning multiple performers for 1 task. • Applying certain settings to filters that are useful to a command can block settings that are already used. 2 Slack is a web service (applications for desktop, iOS and Android are also available) for creating chat rooms and separate groups for discussion with a team, clients or users. • Simplicity and speed of the application (Slack was chosen as an alternative to Skype). • Cross-platform: can be used from any device. • Ability to create separate groups. • Free as long as you do not exceed the limit in messages. • All the main features are scattered and hidden in the drop-downs. • It is not possible to customize the interface. • No ability to turn off notifications. 3 GanttPro - Gantt chart that allows you to plan and manage projects online, visualize processes, create tasks and assign them to participants, set deadlines and percentage of individual tasks and the project as a whole, add milestones, and share the created Gantt schedule with the team and clients right to view or edit. • Availability of automatic project planning. • Add files to existing online charts with the ability to comment. • Drag & Drop for dragging tasks, setting a percentage of completion, etc. • Ability to set your own working days and hours for better project management. • Automatic recalculation of the duration of tasks and projects. • Setting dependencies between tasks. • Ability to create complex, multi-level projects. • Assignment of roles to team members and permissions. • It is not possible to set priorities for tasks. • Lack of integration with Jira and Slack. 4 Redbooth is a web service that is also available on iOS and Android, allowing you to track errors, plan projects and activities, manage resources and assign tasks to project participants, set project deadlines and milestones, monitor project expenses. The service also offers file sharing and synchronization with Google Drive, Gmail and Outlook. Reviews for: simple and intuitive interface; chat features; integration with other services; tags for tasks; ability to create reports. Responses against: there is no setting of the percentage of completion of tasks and tracking the progress of the project as a whole; There is no possibility of prioritizing tasks. 5 Basecamp is one of the most popular online services for collaborating on projects, allowing you to share documents, conduct discussions with the team, create to-do sheets and add comments to tasks, send and receive e-mail. Reviews for: allows you to successfully work together both small and large teams; easy to use; availability of instant update notifications. Reviews against: there is no opportunity for tactical and strategic planning; not enough features to track errors; impossible to evaluate the full picture of the project. 6 Asana is a web-based application, also available on iOS and Android, which allows you to assign tasks, set priorities and deadlines, monitor the status of task execution and the status of the project as a whole. Reviews for: ease of use; it is possible to manage multiple projects within one team; tags for tasks; performance analysis. Feedback against: there is no possibility to assign tasks to several project participants; it is impossible to evaluate the project as a whole; No import / export from / to MS Project. 7 Trello is a popular online service that allows you to organize your tasks, to-do sheets, discussions and ideas on one board. Reviews for: intuitive; free if you are not going to use extensions; ability to set priorities. 8 Gemini is a project management application written in .NET that includes an error tracking system. Gemini can be used both for classic project management and as part of Agile and Scrum methodologies. Reviews for: fully customizable interface. Reviews against: problems may arise during the first setup; heavy documentation. Reviews for: it is possible to install the software on your own server; Great for big teams. Reviews against: no general visualization of projects; inconvenient navigation; There is no way to quickly plan sprints. 10 Teamweek is a web-application for creating Gantt charts, like GanttPRO. Available also on iOS. Reviews for: nice interface; ease of use; great tech support. Reviews against: there is no possibility to establish dependencies between tasks, the percentage of completion and monitor the overall progress; no deadlines; cannot create multi-level projects. 11 Merlin is another software for creating Gantt charts for Mac OS X with the ability to keep track of costs and project budget. Reviews for: it is possible to install the software on your own server. Reviews against: like most desktop applications, low mobility; Available only for Mac OS X users. 12 Taskify.us is a simple application for creating a list of tasks and managing them along with your team like Kanban boards. Reviews for: free and does not require registration. Reviews against: for this level of application they are not. 13 ActiveCollab - like all project management services, has the ability to work on projects with the team, manage tasks, monitor progress. But besides this, ActiveCollab offers to download current expenses and invoices, allowing you to instantly pay them using PayPal or a credit card. Reviews for: ease of use; convenient filtering of tasks; possibility to mention in the comments of the project participants; co-writing content; offers a solution that you can install on your own server. 14 Zoho Projects is a project management software that allows you to plan projects with a team, create and assign tasks, keep track of changes, create reports and analyze performance, comment and discuss tasks and receive summaries of discussions of each task. Reviews for: besides Zoho Projects, you can also use Zoho Mail, Zoho CRM, Zoho documents, depending on the needs of your company. Reviews against: due to the large number of features, users may simply not find the ones that they really need; starts to slow down after downloading files. 15 Freedcamp - the service is an organized workspace for instant viewing of the whole project, assigning and assigning tasks using stickers and a calendar. Freedcamp offers add-ons for CRM, invoicing, bug tracking and wiki pages. Reviews for: it is possible to prioritize tasks; You can divide all projects into separate tabs; ease of use; fast and high-quality user support. Reviews against: your expectations from add-ons may be too high; There is no opportunity to set the progress and percentage of tasks. 16 ManagePro is a desktop application that includes the main features for project management: a Gantt chart, assignment of tasks, prioritization of execution. Reviews for: web interface as an extension. Reviews against: installation and configuration will take some time; There is no way to immediately start using the online version. 17 Bitrix24 is a service that includes task management, planning projects and their execution time, visualizing information on a calendar, the ability to share documents, create virtual workgroups and receive notifications. Reviews for: can be used as a CRM system; wide opportunities. Reviews against: heavy to use; minimal visualization of tasks and projects in general; impossible to customize: many features that you will never need; additional fee for updates. 18 Podio - an application that allows you to work on projects with the team, manage projects and tasks, store and share files. The application can be used as a CRM system, or an intranet, in which your colleagues can interact. 19 Wrike - a unified system for working on projects with a team with advanced functional features: it allows you to assign roles and create workspace for each department, set and discuss tasks, monitor their status and progress, share files, and display project tasks on a diagram Gantt and receive weekly reports. Reviews for: convenient for both large and small teams; It is possible to create separate folders for individual projects. Feedback against: creating branched multi-level projects, you can easily get lost in navigation. 20 Smartsheet is a veteran on the project management services market. Allows you to create Gantt charts for your projects, set tasks and assign them to project participants, set deadlines and monitor progress, as well as attach files and a million more. Reviews for: a serious tool for project management, which should be considered as a long-term investment of your company. Reviews against: not suitable for small teams; slow tech support; To understand and start working with the service, you will have to spend a lot of time. 21 Acunote is a task manager for developers that allows you to plan sprints, add tasks to your backlog, assign tasks to team members, estimate, monitor progress, and, if necessary, review the code. Reviews against: no mobile application or optimization; UX / UI is far from user-friendly. 22 ProofHQ is an application that allows you to share documents / designs / prototypes, comment on the team and make decisions together, let you leave comments to customers, download different versions of the project and share them. Reviews for: continuous support of the application, ease of use, the possibility of discussion with the team, integration with other services. 23 10,000ft - task manager, allowing you to create a profile for each project participant, work on projects with the team, assign tasks, and monitor the workload of each participant. All on one sheet. Reviews for: you can get a complete picture of all tasks and all participants. Feedback against: suitable only for small teams, it is impossible to specify long-term goals and estimate the completion date of the entire project. 24 Insightly - CRM and project management system with integration with Gmail / Google Apps and Outlook 2013 / Office365. Allows you to quickly manage tasks and keep track of statuses within the marketing and sales department. Reviews for: easy setup, adding contacts and using the system; there is an app for iOS; simple nice interface. Reviews against: not suitable if your work is not tied to customer relations. 25 Tribe is a Web-based service that allows you to assign tasks and monitor the status of their execution using e-mail. Reviews for: ease of use; instant notifications of new tasks, there are applications for mobile devices. Reviews against: it is impossible to set deadlines for the tasks. 26 WorkingOn is an online service that allows you to notify other team members with short posts about the tasks and their status you are currently working on. Reviews for: it is very fast and very simple. Feedback against: of course, WorkingOn, perfectly coping with the task of instant communication, can not be a solution to the problem of project management. 27 Process Street is a business process management service that allows you to create workspaces, set tasks and create checklists and SOP (standard operating procedures), monitor processes in a company, set rights, plan activities and manage projects together with colleagues. Reviews against: there is no possibility to sort tasks by dates of execution and performers, there is no possibility to upload projects and checklists. 28 SprintGround - Agile / Scrum service for task manager, planning sprints and releases, tracking progress, working on projects with the team, allows you to report bugs and requests for new features based on feedback from users. Reviews for: free for small business, optimized for Agile. 29 RunMyProcess - the service focuses not on a holistic project management application and not on integration with other services, but on building your own solutions, connecting already used services and communication channels. Reviews for: very convenient when you can not find a service that meets all the needs of your company. Reviews against: despite the apparent ease of use, creating your own application based on RunMyProcess will take some time. 30 OneSoft Connect is an HR and task manager offering to create a profile for each team member and manage tasks, monitor performance and workload. It can also be used as a CRM system. Reviews for: the ability to put tickets to team members, as well as the ability to store data and establish links between them. Reviews against: not suitable for integrated project management. 31 Task Manager - software for desktops (Windows 8, 7, Vista and XP), which is a simple task scheduler. Allows you to divide projects into tasks, manage tasks and delegate them to team members. Reviews for: there are notifications and quick templates; free 45-day trial. Reviews against: it takes time to deal with all the functional features; the quality of technical support depends on the manager; conditional mobility of the system. 32 PayPanther is an application not so much for project management (although this feature is also present), as for tracking online payments, creating invoices, and also maintaining bookkeeping. Reviews for: easy to use; CRM system is integrated into the application; allows you to keep track of internal metrics. Reviews against: not suitable for collaboration of a large team. 33 MS Project is a giant in the project management market, which is based on the Gantt chart, which allows you to plan projects and manage resources, plan what-if scenarios, and set and monitor deadlines and progress. Reviews for: stable system, which there is reason to trust. Reviews against: this software is available only on the desktop, there is no mobility; it will not be possible to quickly understand it because of the large number of not always necessary features; There is no way to quickly share the project. 34 ISETIA is a project management service that combines a Kanban board, a hierarchical task structure and a Gantt chart. Allows you to share documents and files in the system. Reviews for: a fairly simple interface, the ability to visualize data in different forms. Reviews against: it does not seem that the service still has support. 35 Kanbanery is a popular project management service using Kanban boards. Reviews for: you can quickly start using, there is an opportunity to share projects with customers. 36 Nutcache is a web-based application for tracking progress, task status and time, billing, as well as tracking costs and managing projects. Reviews for: ease of use, as I see it, a good solution for sales managers. Reviews against: no automatic billing, no opportunity to work with team members. 37 Eylean Board is a desktop client (no web application) for managing Agile projects, which is a task board for Scrum and Kanban. Reviews for: flexibility and simplicity of the interface, there is integration with TFS. Reviews against: no possibility to set subtasks. 38 KPI Fire - service allows you to set short-term and long-term goals for team members and monitor the progress of the project. 39 Odoo – сборник open source приложений для бизнеса, включающих в себя системы CRM, POS, создания сайтов, eCommerce, продаж, выставление счетов, ведения бухгалтерии, слежения за ресурсами, HR, а также сервисы для управления проектами и маркетинга. 40 Crowdicity – сервис управления идеями, имеющий внушительную базу клиентов: LEGO, WWF, BBC, P&G, Deloitte, John Lewis и другие. Позволяет членам команды выдвигать идеи и голосовать за них. 41 Camayak – сервис не станет находкой для управления it-проектами, но отлично подойдет для управления издательствами и совместной работы специалистов по маркетингу и контент- и smm-менеджеров. Позволяет устанавливать дедлайны, планировать активности, вести все переписки и обсуждения на одной платформе, а также координировать действия отдела контента и дизайнеров. 42 eXo Platform – сервис, объединяющий всех сотрудников, разработчиков и клиентов вместе. Является некой комбинацией всех каналов коммуникаций, от интранета, почтовых ящиков, до социальных сетей и блога. 43 Kindling – сервис позволяет членам команды делиться идеями и быстро высказывать свое мнение о предложениях других участников. Таким образом, вы можете выстраивать свою работу, спрашивая мнение каждого участника. Отзывы против: не хватит функциональности для планирования, для планирования нужно будет использовать тот же онлайн сервис Jira или график Ганта от GanttPro .